Rooms from $82.00 per night. Description This Athens, Georgia hotel has an outdoor pool, free internet access, non-smoking guest rooms and an on-site restaurant. 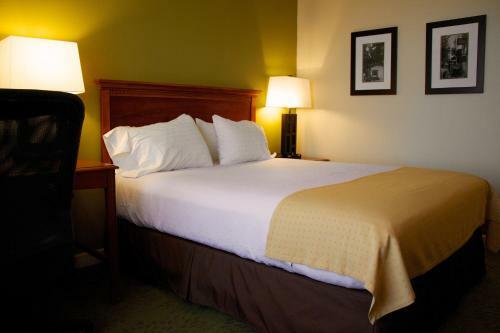 Being practically on campus and strolling distance to the best of downtown Athens has our guests singing the praises of the non-smoking Holiday Inn Athens-University Area. 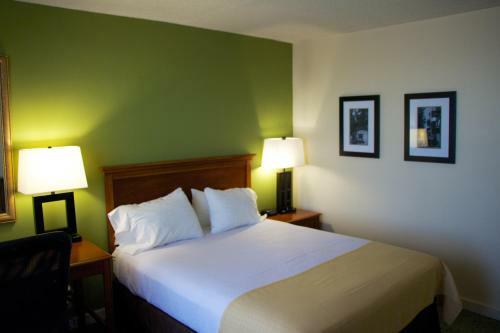 Reassuringly neutral and comfortable all 222 rooms keep things interesting with expanded cable with HBO and more. our guests also acknowledge that the modern common areas are worth taking advantage of. These include the on-site restaurant open for breakfast lunch dinner and drinks and an art-deco lobby lounge area. For high-impact and low-impact enjoyment there's an on-site fitness center and hot tub to enjoy. Guests get free parking slots (ask about game-weekend parking). Located right at the northside entrance to the University of Georgia the property puts guests in the heart of Athens' downtown music entertainment and academic scene. If you're touching down for a Bulldogs football game you can hike to Sanford Stadium in 10 minutes. If exploring Athens' vibrant music scene is where you want to be you'll find some of the top venues in town within a couple of blocks. The hotel is less than four miles from the Athens-Ben Epps Airport. Add Holiday Inn Athens to your free online travel itinerary.